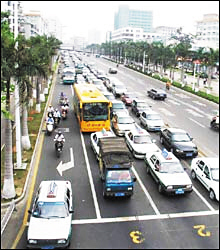 Sanya government has issue a new regulation that motor vehicles which fail to meet the national emission standard will be forcedly confiscated and scraped as the number of motor vehicles keeps increasing in Sanya.. According to the new regulation, buses and taxis which run in Sanya have to get approval from the National Environmental Protection Department and meet the national emission standard. Sanya Environmental Protection Department, Sanya Public Security Bureau and Sanya Transportation Department will work together to make casual inspection on motor vehicles which run in Sanya. As for the motor vehicles which discharge black smoke, they will be forced to get repaired and the driver’s driver license will be suspened by law enforcement officials. If the motor vehicles fail to be repaired in due time, they will be forcedly confiscated and scraped and the driver’s license will be revoked and he/she will get a fine up to RMB 2,000.